"We like the sea and the lake," says Özkan Yilmaz, the owner of Turkitch, a new café in Lakeview just a half-mile from the second largest body of water in the Americas. That's why he reckons so many Turks choose to live in the neighborhood, and why, consequently, there are so many Turkish restaurants there, from the Gundis to Cafe Orchid to ZiZi's and more. Yilmaz brings a unique concept to that group, specializing in Turkish breakfast, sandwiches, and pastries, building on the wholesale line of frozen baklava, börek, and simit he launched three years ago in Milwaukee. Available for purchase in a frozen case next to the register, the branding is a portmanteau of "Turkish and "kitchen" (not an ancient Ottoman skin condition), and the space has a Starbucks-like quality to it. It's bright and open, with plenty of room to stretch out before the gleaming glass display cases showing off the sandwiches, sweets, and a few of the hot dishes. Some of the latter are fairly uncommon in these parts, such as menemen, a saucy tomato, pepper, and egg scramble, or the soujouk omelette, a layer of over easy eggs ringed by coins of salami-like beef sausage. Both are ideally sopped up with wedges of lightly toasted, black sesame-spackled breads, basketed and served with each order. And they're best idled over with ornate demitasses of thick, inky coffee, or curvaceous glasses of black tea. It's a model designed for lingering, and the obverse of Ali Baba Doner, which opened right around the same time, just a couple doors down, and concentrated on Turkey's most recogni- zable culinary export. Doner kebab, the Ottoman ancestor to shawarma, gyros, and tacos al pastor, is perhaps the world's most international hangover remedy, available on street corners and sidewalks all over the planet. Though it's typically carved from upright stacks of spinning lamb, or lamb and veal, owner Atalai Oenem brings a more contemporary chicken variant, via Munich, where he worked in the hotel business. The centerpiece of his storefront is an upright golden cone of laminated poultry—"organic," he'll remind you more than once—which he shaves with an electric kebab cutter that buzzes the sizzling, crisping outer edge of the flesh as it rotates around the heating element. It's a comforting display of mechanical efficiency that seems particularly of Germany, the country controversially credited with popularizing the late-night doner kebab sandwich; meat stuffed in a warm pocket of pita, bedazzled (or disguised) by an array of sauces and garnishes that adapt to whatever country you're eating it in. Oenem offers a fairly conservative selection of these: lettuce, onions, cabbage, tomato, sli- ces of feta if you like, creamy garlic sauce, and chili flakes. You can request it all and he'll still construct a well-balanced sandwich, the cool crunchy salad in harmony with the juicy, caramelized (don't forget: "organic") poultry and its soft, warm pita Snuggie. You can get this in variations: on a plate, with rice or fries, but the important thing, Oenem will stress, is that you eat it right away. 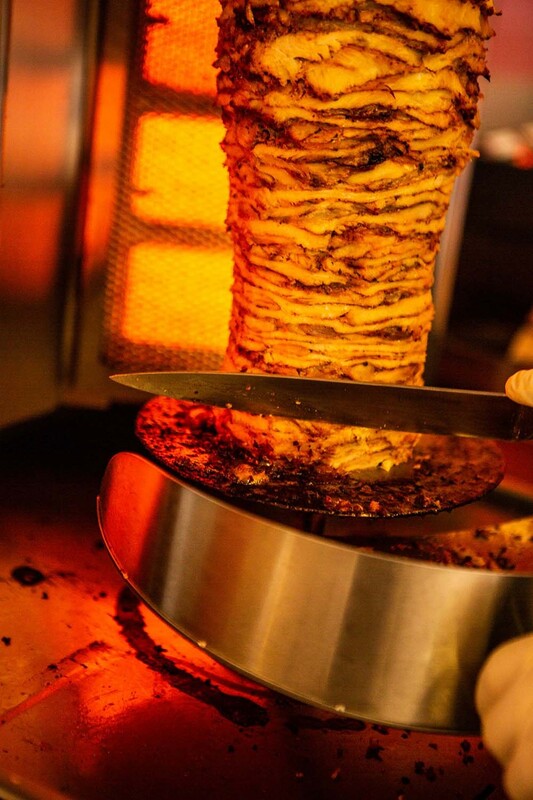 Anyone who's ever stood in line for doner (or al pastor, or shawarma) understands what a grave disappointment it is to approach a glistening, sizzling, spinning monument of meat, only to be served old scraps that had been previously set aside for expediency, maybe even only minutes before. You can't easily see the doner spinning at Istanbul Grill, around the corner and up a couple blocks on Clark Street, a small storefront with more tables and a much broader menu. When I visited one early weekday afternoon I might not have ordered it if I'd seen it first. It was the more common lamb and veal variety, but though the sandwich was (uncommonly) built on a nicely crusty section of baguette, the meat was dry and tough and a chore to get through. Closer inspection behind the counter revealed why: the cone had been whittled down to a gray nubbin, something that couldn't have happened in the short period of time they'd been open that day. But Istanbul Grill has more to recommend it than day-old doner: particularly flatbreads, and namely lahmacun. 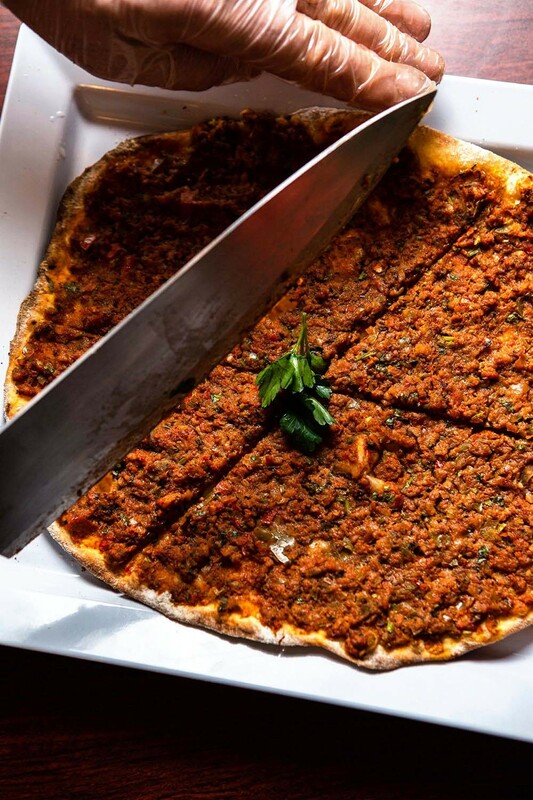 You'll annoy your Turkish friends if you call it "Turkish pizza," but it is a thin and lovely oblong of blistered and charred dough, blanketed with a spicy-sweet tomatoey beef mince. And it is the kind of thing that inspires you to forget your manners and devour it with abandon (and maybe start trolling your Italian friends by calling pizza "Italian lahmacun"). 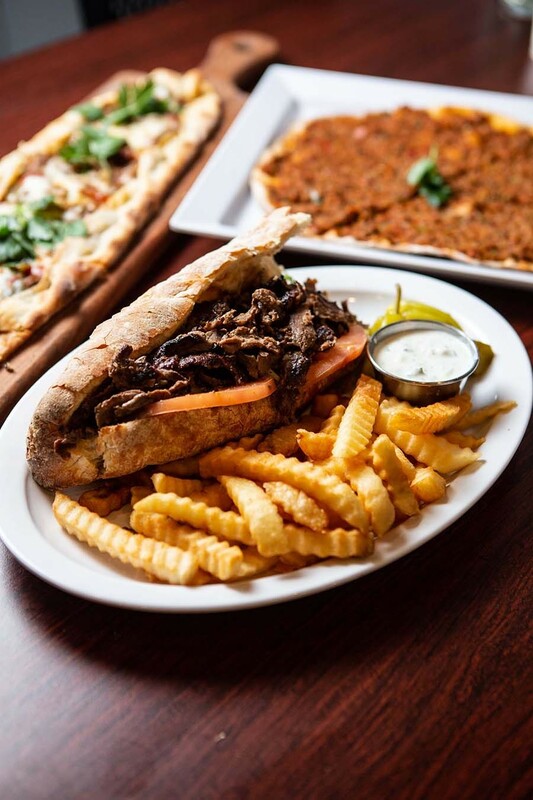 Istanbul Grill features another alluring flatbread: pide, a more risen dough formed in a long, ovoid canoe, filled with, among other possible things, a roasty caramelized mash of eggplant, tomato, and mushrooms, and a molten layer of mozzarella. Istanbul Grill's broad menu encompasses a variety of kebabs, salads, and essentially Turkic things like kazandibi, a creamy, caramelized, resinously-perfumed "burned" milk pudding that my fellow doner explorer insisted I return for after I absentmindedly left it behind. 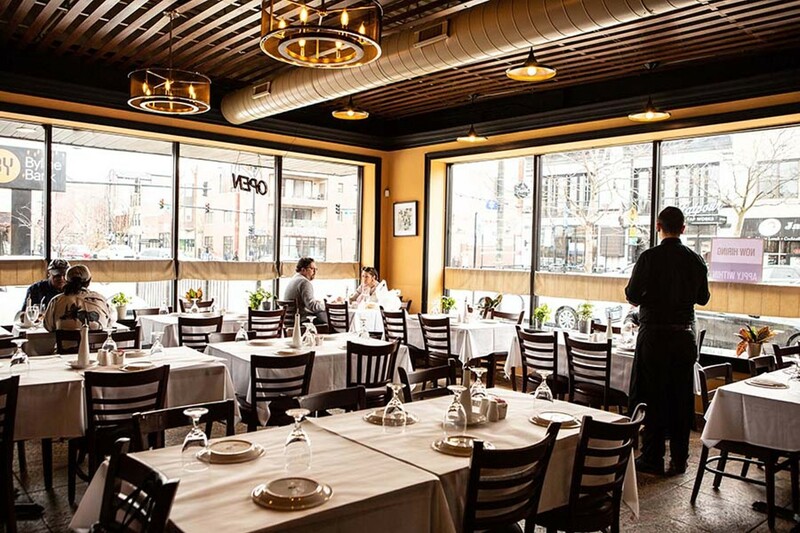 The variety there is in some part thanks to Chef Mustafa Guler, formerly of Roscoe Village's Turquoise. Guler was lured out of a brief retirement to open this place last summer under the rubric Café Istanbul, which he has since taken far away from the water to Wicker Park, in a more formal white-tablecloth setting where you can order risotto and ribeye alongside your patlican salatasi and imam bayildi. 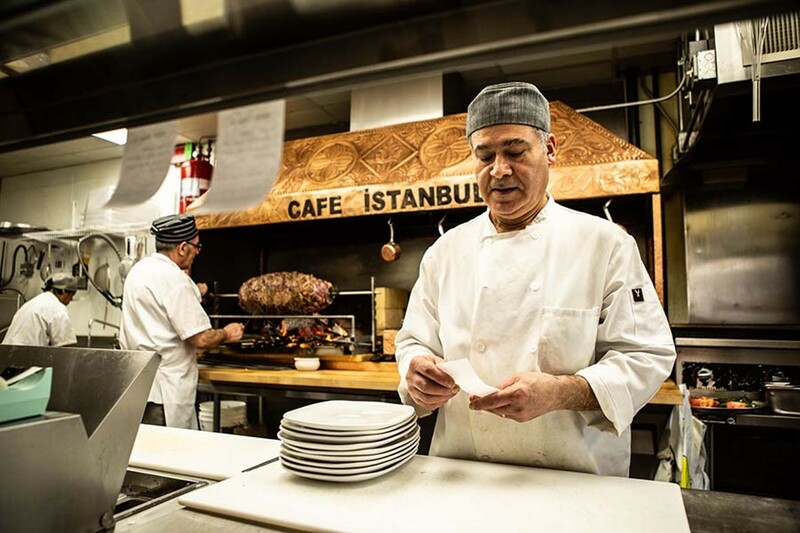 It's the last place you'd expect to see street food, but Guler offers classic lamb and veal doner as well, in addition to perhaps its most magnificent and dramatic variation: cag dza kebab. 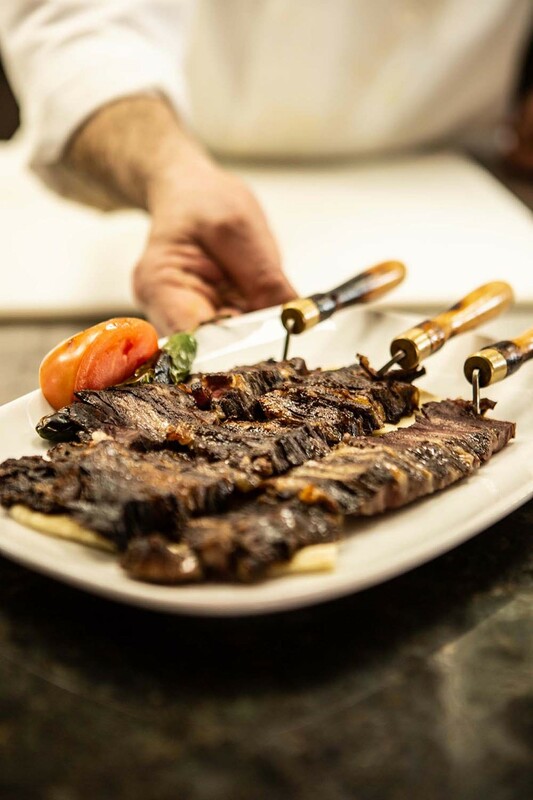 Originally from Turkey's far eastern Erzurum Province, it's a stack of juicy, all-lamb shoulder and saddle, interspersed with tail fat, all impaled on a horizontal spit. 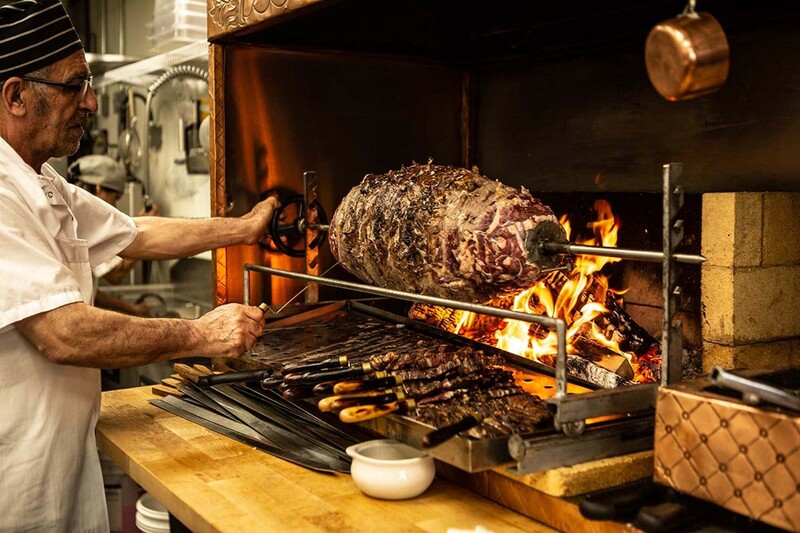 Unlike the space-saving doner machine, this rig makes efficient use of a wood-burning fire, with the meat running parallel to burning oak splits. It maintains a superlative char, as it's threaded onto a skewer and sliced free of the cone. Elegantly plated on a bed of rice, there's no better thing for this than a glass of red, in particular the Turkish varieties Guler has on his list.